There certainly is a spectrum of views on the UK’s ability to plan for and react to extreme weather events. These range from the average man on the street complaining that the UK will always grind to a halt after only 1 cm of snow, to the opinion that we are learning from previous cold weather experience and beginning to become more resilient as a nation. The recent performance of BAA and Northern Ireland Water suggest that the contingency plans of some infrastructure organisations have not accounted for extreme disruption scenarios. However, there may be some small glimmer of light at the end of the tunnel in the form of a review of the local authorities’ response to this year’s cold snap. This complementary report indicates that the local authorities have learnt lessons from the previous two winters. Can any differences in performance between local authorities and infrastructure organisations be attributed to the difference in mandatory contingency planning requirements for first responders (governmental bodies, the NHS) and second responders (utility companies)? Or is it more to do with the level of scrutiny following the disruption during the previous two winters (reported to cost the UK economy £1bn), which resulted in the Winter Resilience Review (final findings published Oct 2010)? – Alternative sourcing options. By exercising ‘contingency’ contracts, farmers and their tractors were quickly mobilised with their snow ploughs to clear the highways. – Increased buffer stock. Following the well-publicised shortage of gritting salt last year, the government has taken decisive action to increase the national salt stock pile and then make local authorities pay through the nose if their own stocks are inadequate and they need more in a hurry. As with most supply chain contingency planning, it’s all about justifying the investment in the solution by quantifying the potential impact of the threat. Some ERP systems, such as SAP, JD Edwards and Dynamics have very strong Supply Chain functionality, however do not focus on the SCRM issues addresses by SCAIR. Whilst ERP systems manage the resources, SCAIR translates the financial impacts and is a very cost effective method of interpreting the outputs from ERP systems into valuable management information for mitigating the impact of supply chain failures. Who uses SCAIR, our Risk Management Software? SCAIR, our award winning Supply Chain Risk Management software is in use by a number of global organisations who understand the criticality of their supply chains and want to protect themselves against their disruption. Pharmaceutical Industry: two of worlds top Biopharmaceutical companies use SCAIR. Telecommunications: a world leading telecoms solution provider uses SCAIR. Manufacturing: Fortune 500 Multinational Corporations rely on SCAIR. Biotechnology: A large, multinational, biotech / life sciences company uses SCAIR. Packaging: SCAIR is used by a worldwide packaging and distribution company. 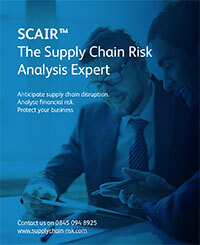 Contact us to discuss how SCAIR can help you improve your supply chain resilience. 2010 – a year of surprises? Or was it all pretty predictable? 2010 started uncomfortably for certain organisations with freezing Eurostar trains stuck in the Channel Tunnel and the threat of Pandemic flu still just lurking just over the horizon. April brought disruption for many more companies with the volcanic ash cloud casting an impenetrable shadow over the movement of goods and people in Europe. Car production lines came to a standstill when critical components were failing to arrive ‘just-in-time’. •	Should these organisations have been better prepared for such eventualities? •	Where were their contingency plans? The defence is invariably that “these acts of God were unforeseeable”. Is that acceptable in the current age of “if it can go wrong, it will”? After all, we live in a world that does not tolerate disruption – there’s no room for slippage in our modern, just- in-time existences. This provided a topic for discussion on Radio 4’s ‘The Bottom Line’ a couple of weeks ago. Their general conclusion seemed to be plan for the ‘FORSEEABLE’ (aka freezing trains), but don’t waste your time planning for the UNFORSEEABLE (aka Ash clouds). If you don’t respond well to the Forseeable then you look silly – the Unforseeable you can get away with. Well, there is a parallel argument that goes something along the lines of ‘plan for the effect rather than the cause‘. There is no point in trying to plan for every single unforseeable scenario (cause), but there is a great deal of value in planning for the impact of the unknown threat ( the effect). Analysing the impact focuses risk mitigating actions on the most exposed areas.